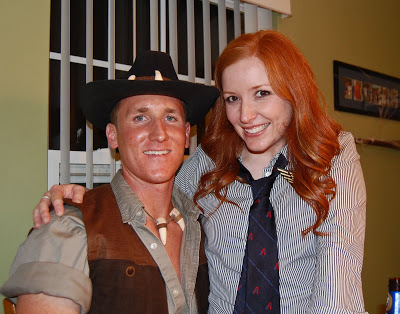 Last weekend was our friends Mo and Ali’s Halloween Party! We’ve decided it is going to be an annual tradition! We had a blast, of course! Me and the husband. The pilot and flight attendant or “air hostess” as Karri was calling me! 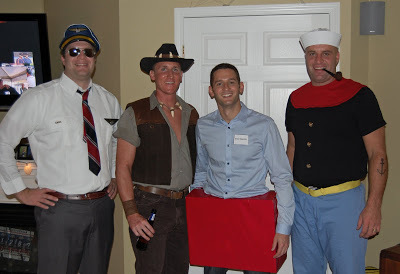 The best part of the husband’s costume is his “Capt” pin that I found in his space camp stuff from when he was 12! Love it. Our host and hostess, Mo and Ali. 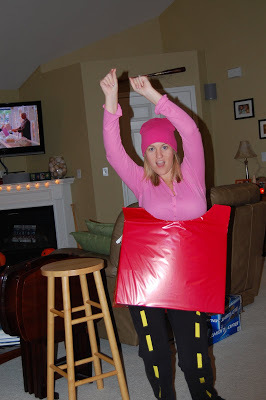 Can anyone guess what Ali was? If so, you get a gold star for the day….it took us a while to figure it out. As for Mo…..lets just say that his name tag said “Richard” and we watched a certain SNL video clip featuring Justin Timberlake. I’m sure you know what I’m talking about…don’t make me say it on this blog! 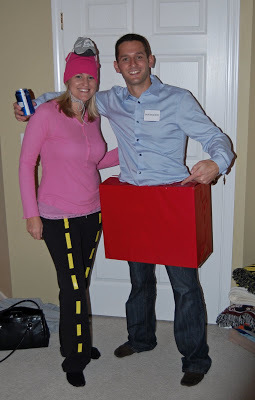 Here is Brett and Karri. 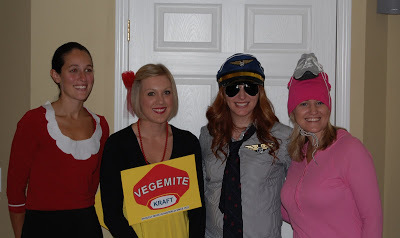 Karri is from Australia, so she made sure to bring a little bit of culture to our party! Brett was Crocodile Dundee! Kari made his costume and it was fabulous! 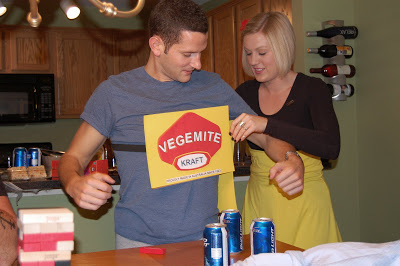 To keep with the Australian theme Karri was Vegemite, which is a popular food paste in Australia. We all thought it was gross….but Karri loves it! Mo’s sister Andrea and her hubbie Mike, aka. 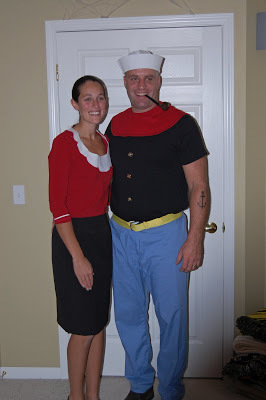 Popeye and olive Oil. Don’t they look great? 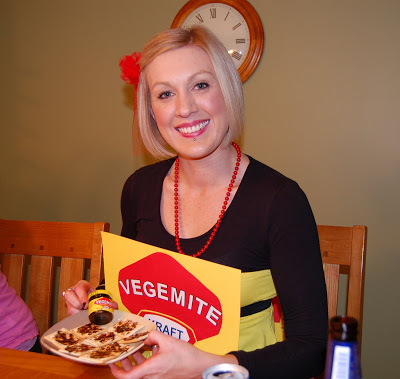 Karri with her Vegemite on crackers for everyone to try. 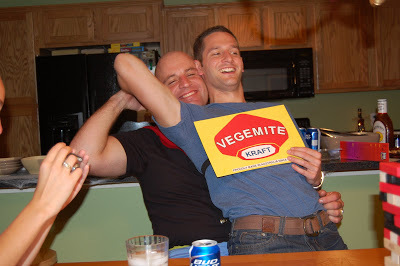 Everyone eating the Vegemite…except me and Brett. We knew better. 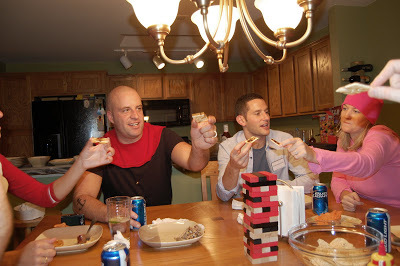 We all played drinking Jenga that had tasks written on each block. 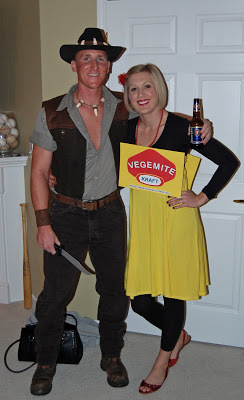 We quickly added “Eat Vegemite” to one! 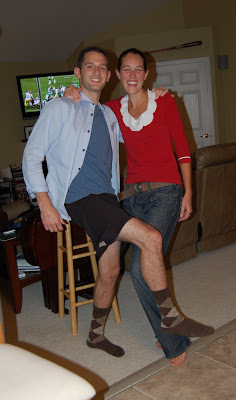 Jenga made us do some weird things….like switch an item of clothing with another player. And sit on another player’s lap. Man I look pale….but Brett’s tan is totally fake. And of course dancing. Sorry Ali, I just had to do it! Thanks Mo and Ali for a great time! We can’t wait for next year! Cute costumes. Looks like yall had a lot of fun. 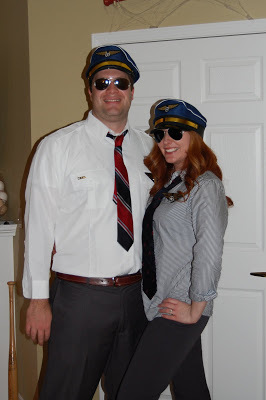 I want to fly with the captain & hostess. When does the plane leave? Is she a piece of gum stuck to a tennis shoe while the shoe is on a road? Yes Jess! Gold star for you! Looks like a ton of fun. Love the costumes. You and John look hot! !